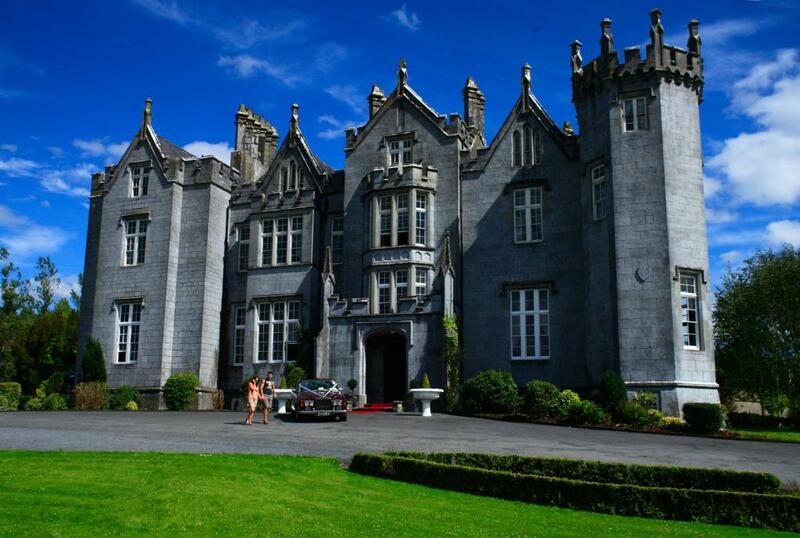 Lock in a great price for Kinnitty Castle Hotel – rated 8.8 by recent guests! 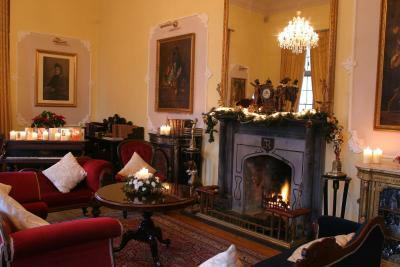 I absolutely loved Kinnitty It is an intimate castle Only 37 rooms So at no point do you feel over crowded. 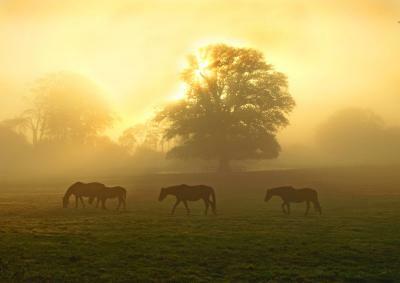 Very friendly staff Informative Extremely cool property Very old Druid circle Thatched roof servant building High cross A hiking trail behind Opportunity to do archery or horseback Loved every minute Slightly spooked from the creaks around the place since it is possibly haunted :)). 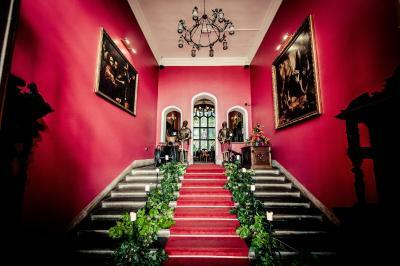 Don’t miss a tour of Leap castle 10 minute drive away for a very haunted experience! Charming, not over-done, castle experience. Grounds are lovely, staff was gracious and breakfast was delicious. We had a great, intimate Trad concert down in the Dungeon Bar. This is a wonderful experience. 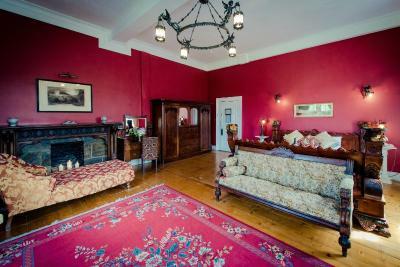 Set near the Slieve Bloom mountains and such an amazing property. Everything was perfect in this hotel!!! The staff is amazing !!! Thank you for make our weekend unforgettable ! This castle is gorgeous and the grounds and surrounding landscape are breathtaking. I only wish we could have stayed longer! The staff was above and beyond. We had the best time here. The food was absolutely delicious and we really enjoyed lounging in the upstairs bar next to the fireplace while we had drinks and dinner. We particularly enjoyed the late night bar in the dungeon. There was live music by a very talented singer/guitarist named Darra. John, our bartender was super friendly and we had a wonderful time chatting with him. He gave us loads of information about sights and things to do while in Ireland. The room was very spacious and the bed was super comfy. We had an incredible view of the grounds and mountains from the windows. I really enjoyed the clawfoot bathtub! Staying in a historic castle was a treat! Staff went out of their way to show us other rooms which delighted my girls. The castle was everything my wife hoped for as a bucket list item. The staff was friendly, attentive and helped us with special requests. 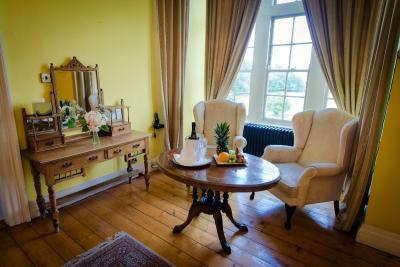 We were assigned the bridal suite as we were celebrating our 20th anniversary of getting married in Kinnitty Castle. It made our stay very memorable. 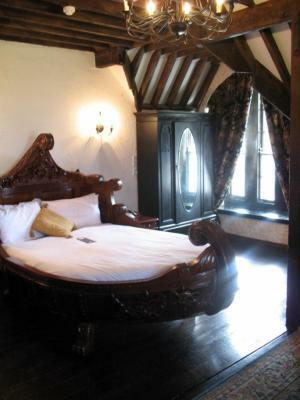 It’s a small “castle” but quite nice, and the king room is huge. The dungeon bar is fun and the staff is great. A memorable stay. 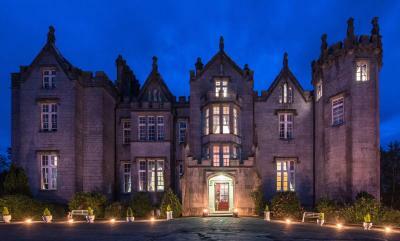 Kinnitty Castle Hotel This rating is a reflection of how the property compares to the industry standard when it comes to price, facilities and services available. It's based on a self-evaluation by the property. Use this rating to help choose your stay! 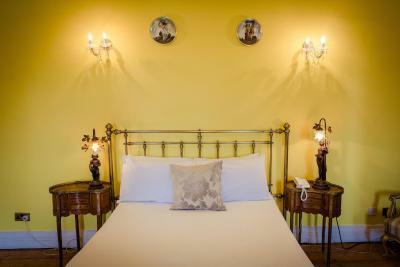 Rooms at Kinnitty Castle Hotel feature classic decor and unique, original features and furnishing. 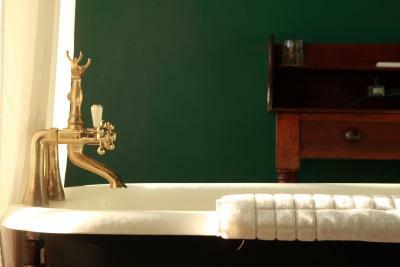 Private bathrooms feature a bathtub, free toiletries, and a hairdryer. Guests can relax in the public areas with complimentary tea and coffee. Sli Dala Restaurant serves gourmet cuisine with Irish and European influences, along with an excellent wine list. 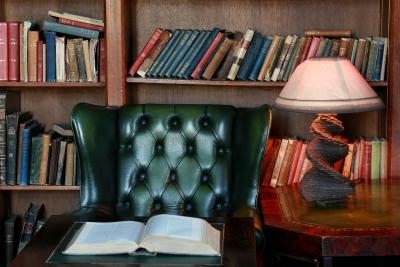 The elegant Library Bar features an open fire, hot meals, and Guinness on tap. 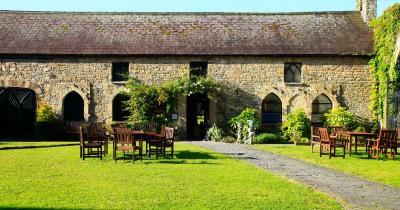 Kinnitty Castle is set at the foot of the Slieve Bloom Mountains, with numerous trails and guided walks available. 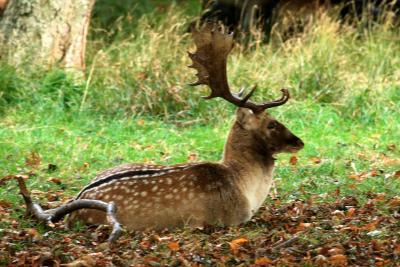 Clay Pigeon shooting is available on the castle grounds, and Birr Castle is a 20-minute drive away. 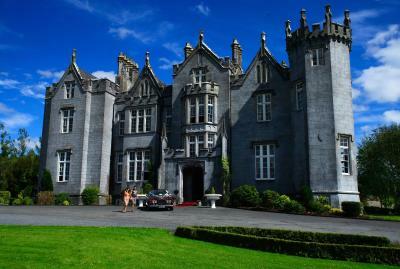 When would you like to stay at Kinnitty Castle Hotel? 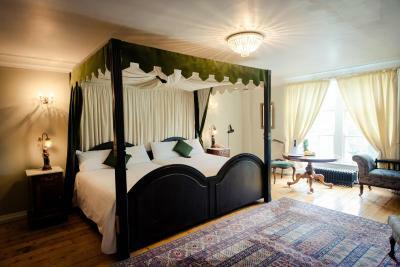 Luxurious room with beautiful grounds and countryside views. 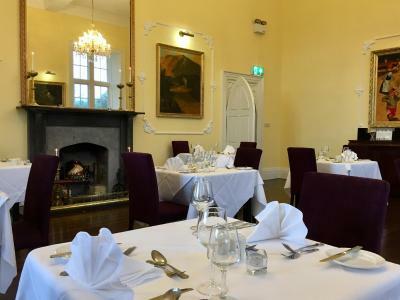 House Rules Kinnitty Castle Hotel takes special requests – add in the next step! 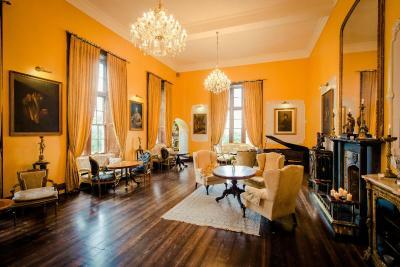 Kinnitty Castle Hotel accepts these cards and reserves the right to temporarily hold an amount prior to arrival. Smoking in the bedrooms will incur a penalty of EUR 100. I got a tick attached to my leg on our forest walk (not the property’s fault), however do remember to pack tick repellant if you’re planning on hiking/walking through the forest at all. All the activities on the property were for an extra charge. The tennis court at least should have been free of charge. The property itself is stunning. 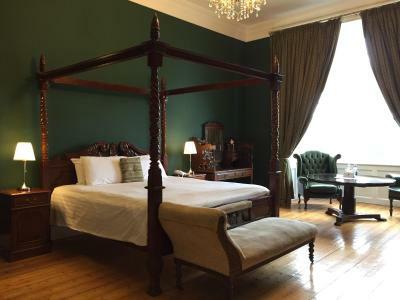 We were escorted up to our room (Ingram Room) in the main castle (do try to request to stay in the main castle, or you could end up staying in the annex) and were really pleased with our room. To say that it was spacious would be an understatement. 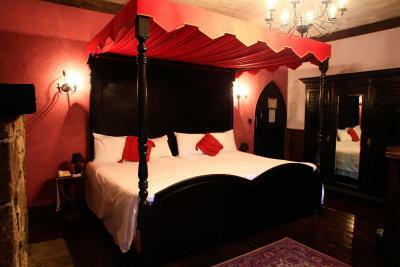 It was a huge room with a king size four poster bed, all in traditional ‘castle-y’ style. I felt like a princess in a fairytale. The bathroom ... wow. A separate shower and a claw footed bath tub in the middle of the room, both with good, hot water and excellent water pressure. The bubble bath and soaps provided smelled divine. The property was situated in the midst of the woods and a nearby horse stable, so it was not uncommon to see horses prancing around (they even came up to us so we could pat them). 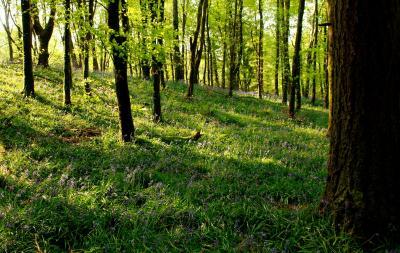 A walk through the forest by the brook was beautiful, and coming upon what seemed like thousands of blue bells was just lovely. Be sure to bring your Deet spray, though. The Dungeon Bar was great for snacks and the live music was excellent. 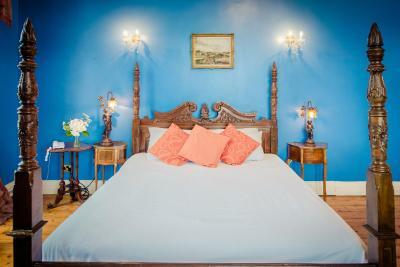 I highly recommend this property as a romantic getaway. Simply lovely. Wifi does not work very well - it could be improved. An amazing place when you need some relax. Had to wait over an hour on our room to be ready unfortunately! We were compensated for that though! 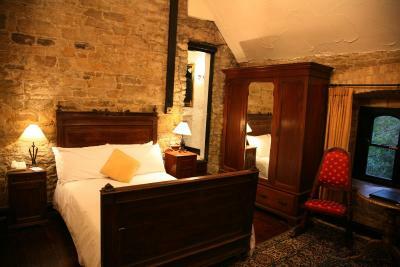 Really atmospheric, rooms were very large and spacious with fantastic bathrooms! Warm and friendly staff! Excellent , just like the pictures I have seen all my life off castles! Beautifull. 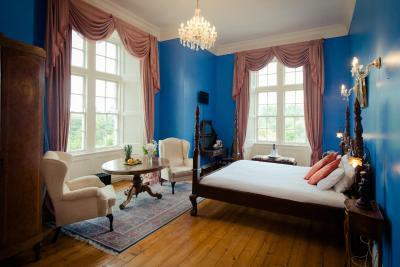 Beautiful suites in the main castle. We arrived in the afternoon & we were upgraded to a suite which was out of this world. The "dungeon" bar had a group of musicians playing on Saturday evening & they were brilliant. 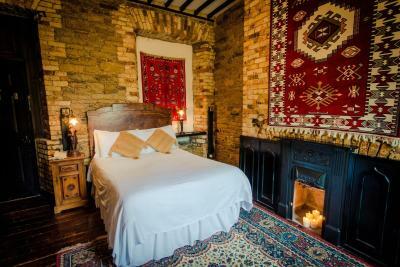 This hotel has a lovely atmosphere about it & I would thoroughly recommend it as a great place to relax & unwind. I would have preferred a bigger range of food in the restaurant on Sunday evening, some of the lunchtime menu items would have suited me more. Excellent overnight for a big family gathering. Hotel hospitality and staff were exemplary. The food was very good. We all had a good stay. 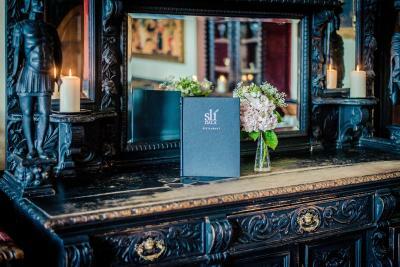 Excellent service and beautiful surroundings. Very impressive to stay in a real castle. Only friendly ghosts around : ).